Thi Dar is a 3-year-old girl who was suffering from Thalassemia. Shortly after she was born, Thi Dar developed jaundice and was placed in incubation and given a blood transfusion. Her hospitalization cost the family a total of 100,000 kyat ($116 USD) which her parents had to borrow from relatives. Thi Dar’s condition improved, but after 3 months, she developed jaundice a second time and again had to return to the hospital for another blood transfusion. Doctors diagnosed her with Thalassemia and said she would continue to require blood transfusions every few months. Thalassemia is a genetic blood disorder in which the body does not make enough healthy red blood cells and produces less hemoglobin than normal. Hemoglobin is an iron-rich protein in red blood cells which carries oxygen to all parts of the body. People who have Thalassemia can have mild or severe anemia. People with Beta Thalassemia Major, or Cooley’s Anemia, need regular blood transfusions (often every 2 to 4 weeks) in order to help maintain normal hemoglobin and red blood cell levels. Signs and symptoms occur within the first 2 years of life and may include poor appetite, dark urine, slowed growth and delayed puberty, jaundice, bone problems, and an enlarged spleen, liver, and heart. After returning home to their village, Thi Dar was well for only about two months before she once again became jaundiced and had to have another blood transfusion, costing 30,000 kyat. Each subsequent transfusion lasted for shorter and shorter periods of time, until the family was returning to the hospital for blood transfusions every two weeks. After the third transfusion, the family could no longer afford the cost of the donated blood and asked a family friend to donate blood for their daughter. Thi Dar’s mother said she has lost count of how many times her daughter has had blood transfusions over the past 3 years. Each trip to the hospital cost them around 20,000- 25,000 kyat (about $27 USD), and each time they had to personally search for a blood donor. Occasionally, they would be able to pay for the hospital visits themselves, but often they would borrow money from friends or family. 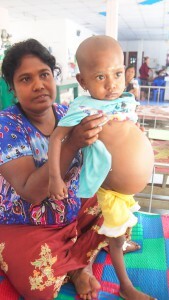 When Thi Dar was one and a half years old, her stomach began to bloat to an alarming size. Seeking answers at the hospital, the doctors told Thi Dar’s mother that her daughter would need to undergo an operation in Rangoon since the local hospital did not have the resources to carry out the required surgery. As the family did not have the money to travel to Rangoon, let alone the money to cover the cost of the surgery, they did not pursue further treatment for her and her stomach continued to bloat. Upon seeing Thi Dar’s condition, a cousin told the family about Mae Tao Clinic in Mae Sot and the free treatment Thi Dar could receive there. Her father sold his horse cart for 50,000 kyat ($58 USD) and left the other two children with their grandmother while he, his wife, and Thi Dar made the journey to Mae Sot. Upon arriving in Mae Sot, her father found work as a construction worker in order to be able to support the family while they travel back and forth to Mae Tao Clinic for Thi Dar’s blood transfusions. However, he is working illegally as neither he nor his wife have legal documentation to live or work in Thailand. Thi Dar’s illness has caused a great deal of stress and hardship for their family. Her mother has been separated from her other two children for one year already, unable to take care of them whilst she is living in Mae Sot. The family is under huge financial stress from the healthcare expenses that have built up over the years. Her mother says she wishes her daughter’s condition will improve so that she can work and help relieve some of the family’s financial burdens. After BCMF sent Thi Dar to Chiang Mai for consultation and treatment, doctors determined that her spleen was enlarged. The spleen helps the body fight infection and remove unwanted material. In patients with Thalassemia, the spleen has to work harder and may become enlarged as a result. The enlarged spleen can worsen the anemia. In the case of Thi Dar, doctors determined that she needed to have her spleen removed. A neighbor in their village told Thi Dar’s mother to leave her untreated because it was simply too difficult to look after her. However, Thi Dar’s mother told us that she could not comprehend how a mother could ever think of doing such a thing. She said she wants to see her daughter healthy and happy once again; living and playing normally like other children.